Among the tastiest and highly prized of all garden vegetables is asparagus (Asparagus officinalis). Part of the allure of asparagus is that this perennial vegetable is the first vegetable harvested in the spring. Fresh asparagus is in premium demand, and a gardener with a good patch of asparagus can save a notable amount of money at the grocery store. Also, the ferny growth is an attractive addition to the garden. Unlike other vegetables, asparagus takes considerable patience, because it will not be until the third year after planting that you can harvest it. This takes some discipline, as the spears will appear in the first and second year, but if you harvest them, then you will very likely kill the plants or at least seriously stunt their production for future years. But if you have planted the crown correctly, fertilized appropriately, and cared for your asparagus for two years, in the spring of your third year you will start to have an ongoing crop that will provide you fresh asparagus each year from early spring until July 1 for about 15 years or so. When the spears appear in spring, harvest them when they are six to 10 inches above the soil line, but before the flower buds are open. Simply cut or snap off the spears at ground level. Continue harvesting for six to eight weeks, but no later than July 1. If you notice decreased production and vigor in your asparagus plants, stop harvesting and let the plant store energy for next season. Any spears that reach a height of more than 10 inches should be allowed to continue growing to build root systems and energy for next year. Planting Asparagus for the First Time? Asparagus likes a deep, loamy, well-drained soil, and grows best in an area that gets at least eight hours of direct sun each day. Asparagus requires a period of dormancy each year; this is not a vegetable for warm southern climates that see no dormant season. 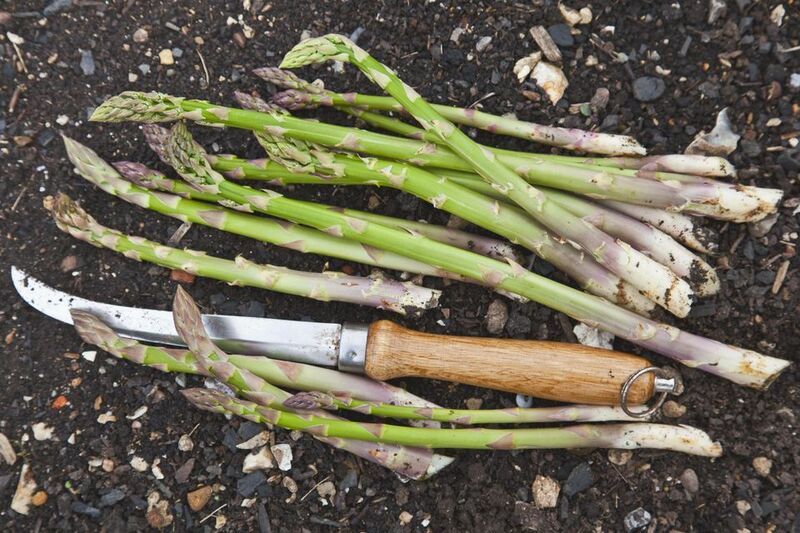 Asparagus plants are heavy feeders, so be prepared to amend your soil and fertilize regularly. Because the edible part of the plant is the stems rather than the leaves, the nutrient most required is phosphorus, not nitrogen. Trench: Dig trenches for your asparagus that are about eight to 10 inches deep, and spaced about four feet apart. Fertilizer: Spread a phosphorus fertilizer in the bottom of the trench. A 0-20-0 fertilizer is ideal (the numbers and dashes describe the amount of nitrogen, phosphorus, and potassium, respectively, in a fertilizer). The organic fertilizer option here is a good thick layer of bone meal. Plant the crowns: Place the purchased asparagus crowns flat in the trench, right on the layer of fertilizer. Space them 12 inches to 18 inches apart. Cover with about two inches of soil, and water the area lightly. Replenish the soil: As soon as two inches of new growth appears, backfill the trench with more soil. Do this several times as new growth appears until the trench is filled in. Maintenance: Keep the area weed free, and fertilize annually with a balanced 10-10-10 fertilizer each spring. First harvest: In the third year, make your first harvest a light one. Once the plants become more robust in subsequent years, you can harvest more heavily.